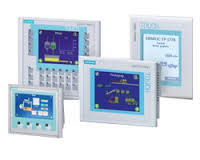 Human Machine Interface, can take the form of any plant visualisation including indicator lamps, message displays and touch screens, our engineering staff are fully conversant with all the major HMI Systems. To provide good visualisation of the operating conditions of the control system is key to a successful implementation of any project. We make it a priority to work closely with all our customers to provide an efficient and clear ‘front end’ to their control systems, utilising both their site requirements and our experience.